The TJP2655LT, TJP2665LT, TJP2675LT TJP poultry inlets consist of a complete poultry inlet with housing and light trap. 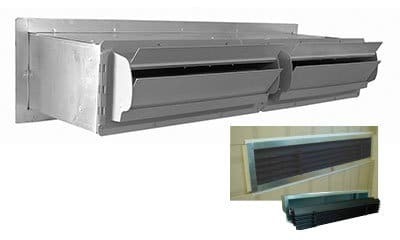 This wall air inlet is designed with a weighted counterbalance louver that opens from the top instead of the bottom. This directs air along the ceiling and holds air up longer while mixing with room air. Minimal air restriction from the light trap.